I grew up accepting that I would have to adjust my lifestyle around men, their advances, their violence. It happened every day in India. Women were brutally raped, assaulted and killed on a daily basis, sometimes in cities, many times in remote, isolated villages and towns. What were the messages Bollywood had been teaching us for decades? What had our history taught us about men, and women? What were our own biases? She went on to describe how she did whatever she could to "stay the hell out of India" — the many paths she took in the US to achieve this, including joining the US Army at 23, before gaining citizenship. It's not that Bhattacharyya is looking at America through rose-tinted glasses. What she describes, without using the actual words, is the affinity she has for America's "loose" culture versus India's "tight" culture. 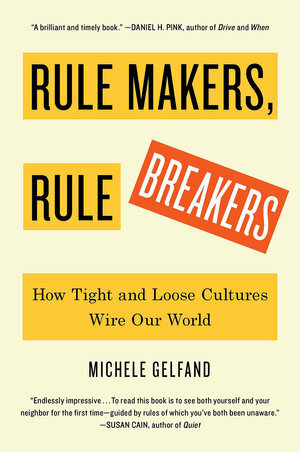 It is these two broad culture types that Michele Gelfand explores in her book, Rule Makers, Rule Breakers: How Tight and Loose Cultures Wire Our World. Tight-loose differences emerge in boardrooms, classrooms, and bedrooms, around negotiating tables and dinner tables. Seemingly idiosyncratic features of our everyday lives—including how we behave on public transit and at the gym, and the kinds of conflicts we have with our friends, partners, and children—all fundamentally reflect tight-loose differences. There are plenty of studies and experiments — some popular in the annals of socio-cultural anthropology and cognitive science and some undertaken by Gelfand's colleagues from across the globe — cited to demonstrate how we are a super-normative species and hardwired to follow social rules and conventions. Even toddlers with minimal language skills are capable of interpreting norms from their environment, following them, and punishing violators. In fact, group norms are so powerful that they can override our individual sense of right and wrong. All of this makes us the most cooperative species on the planet. We like to come together in communities and follow similar routines and rituals. Often, we do all this coordination as if on autopilot. Not only does this help us get along better but it ensures we help each other out in difficult times. In his book, Sapiens, Yuval Noah Harari has also examined this evolutionary development of cohesive behaviors that helped our ancient civilizations hunt, forage, survive, and thrive. Harari and Gelfand also seem to agree that, while actual norms have changed over the centuries as humans have evolved, the underlying template for how we create those cultural norms remains the same: derived from our fears of perceived internal and external threats. The flip side is that the need to belong to some group or other makes it possible for some of us to get radicalized against other groups that might be perceived as threats. So norms have also helped create much conflict all over the world. Beyond war-level conflict, Gelfand also takes us through some well-known examples of such radicalization of individuals who have felt marginalized or culturally adrift. While the many research studies sometimes seem repetitive when belaboring the same points, the interspersed real-life examples from around the world are more engaging because of how Gelfand connects them back to study findings. Synchronized behaviors and their feedback loops in everyday life take on more weight and meaning once she peels back the layers to show why they exist. Gelfand also uses current examples of political authoritarianism — cultural tightness — across the world, particularly in the US, to explore how they are responses to the threats of preceding or perceived cultural looseness. Further, as we have seen, authoritarians like Trump, Putin, Duterte, et al know full well (they've had many knowledgeable predecessors to learn from) how to create that climate of threat that only they can supposedly resolve. They also know exactly which socioeconomic, gender, and ethnicity groups will be most vulnerable to particular kinds of threats. The most interesting study is where Gelfand worked with colleagues across many countries to develop measures to "directly compare the strength of social norms across cultures, explore their evolutionary roots, and identify the pros and cons of norms being relatively strong or weak." This study went beyond national differences and dove deeper into the organizational and community levels to understand how crime rates, economic development, political stability, artistic creativity, education levels, business innovation, physical health, emotional well-being, population density, disaster management, legal regulations and more, were affected. The results, in several cases, surprised even Gelfand and her cohorts. One of the main findings of the study was that "tightness-looseness is a continuum, with extreme cases at either end and varying degrees in between." At the extreme levels, neither type of culture is beneficial. Also, despite default tight/loose settings, there are temporary shifts or waves of tightness and looseness in a culture or person at any given time due to major events or transitions. How these shifts manifest depends on the depth of our cultural programming and the strength of our normative radar in picking up situational changes. Gelfand recommends an ongoing Goldilocks-like balance in managing aspects of tightness and looseness within our cultures. She gives a few examples of how certain educational institutions and communities are structuring pockets of tightness or looseness into their cultures. One particular intervention involved American and Pakistani students reading each others' diary entries. The exercise blasted through the usual stereotypes each culture typically has of the other and re-calibrated the participants' understanding of and empathy for the "other". Pakistani participants who read Americans diaries viewed Americans as more moral and as having less of a sense of superiority over other cultures. And, by the end of this intervention, our American participants who read diaries written by Pakistanis viewed Pakistanis as less violent and more fun-loving. Circling back to Bhattacharyya's situation, above, her article generated the usual backlash on social and news media (which, of course, is what the online publishers wanted.) It wasn't just the usual Indian nationalists who took offense. Many urban, educated, woke individuals said she was disparaging her country of birth to justify her choice. Several responders suggested that, if things in India had upset her so much, she could have stayed and worked to create the changes she wanted. Almost all cited various positives of Indian culture against the negatives of US culture. Ironically, this very ethnocentrism is, per Gelfand, a hallmark indicator of a tight culture — which is exactly what Bhattacharyya did not want to identify with anymore. However, again, she did not have the tight-loose language to frame it so. Perhaps, if the article had been framed with such language, the arguments about cultural differences that arose might have been more productive. In the book, Gelfand also writes about "biculturals" — people who are comfortable with routinely switching back and forth between tight and loose cultures. They've learned, not without some personal cost, to adapt their mindsets so that they can navigate flexibly beyond the default or baseline tightness or looseness they grew up with. Their tight-loose ambidexterity is an example of the Goldilocks Principle, because they can toggle back and forth to find their "golden mean" as related to their present situation. Gelfand mentions how interdisciplinary neuroscientists are studying the particular cognitive orientation that enables such mindset adaptation more easily in some people than in others. Of the many books about cultural anthropology or social theory emerging these days, few manage to cohere to a strong, compelling thesis throughout (e.g., Yuval Noah Harari's Sapiens; Lucy Jones' The Big Ones; Joshua Greene's Moral Tribes). Fewer still manage to address all the major concerns of our increasingly complex societies today. Gelfand has checked both those boxes and she has done it with just the right number -- not too many, not too few -- of supporting practical, pragmatic examples. As the Distinguished Psychology Professor at the University of Maryland, her interdisciplinary approach to all things cultural is very much in evidence here. The more we recognize the impact of our cultural programming, the better we can understand not just others, but ourselves — and cultivate the capacity to solve our biggest problems. Our ability to grasp the nature of our differences, why they exist, and what trade-offs are involved allows us to successfully navigate an increasingly globalized world. Norms have shifted within cultures over the centuries, often dramatically, and will continue to shift, but their basic code — tight or loose — remains timeless.